These ornaments we got while in vacation in Disney last year. 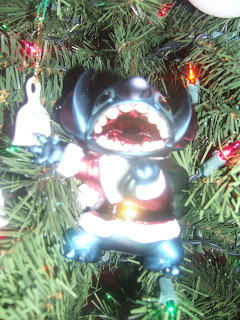 Stitch is Jeff's favorite ornament and the mickey is mine. He's a stitch fan I'm the mickey fan. I just LOVE the christmas shop in downtown Disney! This ornament Jeff and I got in the mall at one of those ornament stands. This was our first christmas in 1997. Holy Smokes that is 10 years ago! Wow! The elmo ornament we bought in 2004 for our son Dylan it would have been his first christmas but he passed away and became an angel on Dec. 6. 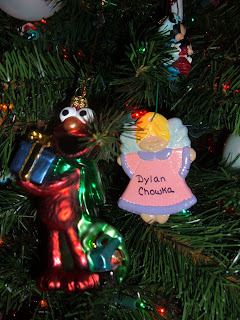 The angel ornament I painted a long time ago and then when I took it out of the box the other day I decided to write Dylan's name on it even though the angel is wearing pink and purple really not boy colors. 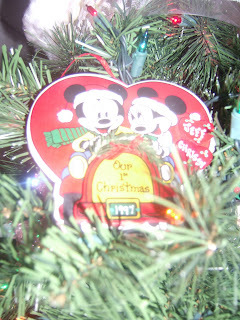 This ornament hangs in the center of our tree as remberance of our little angel Dylan. This ornament we got my parents when we first moved in our house. 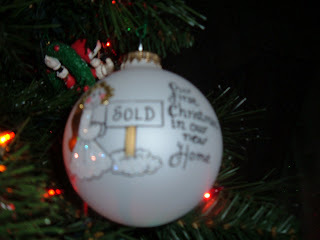 It says Our First Christmas in our New House. decorating our Christmas Tree. 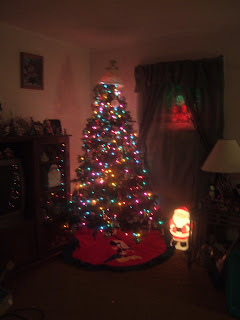 Its a small 7 ft tree but if it was much bigger it wouldn't have fit in our living room. We have a lot of ornaments on the tree that are very dear to our hearts. 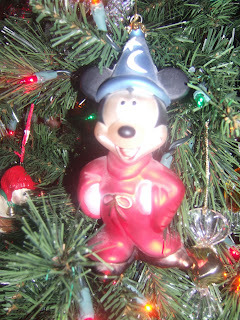 I will post pictures this coming week of those special ornaments. Our tree has no "official" theme to it there is a little bit of everything from bears to glass candy canes, to different decorative balls, to santa's to disney. After we put up the tree we then noticed that we forgot the garland. But that's okay the tree looks find as is. We don't like tinsel it makes a BIG mess and I'm not sure how the dog would be if tinsel hit the floor I'm sure he would chew on it and get sick because Buddy feels EVERYTHING belongs in his mouth. 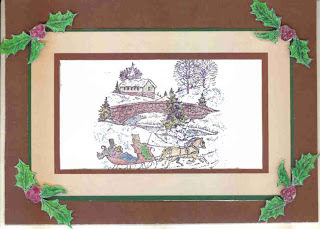 Happy Holidays to you and your familes! Today Jeff and I spent the day outside in the cold putting up christmas decorations. 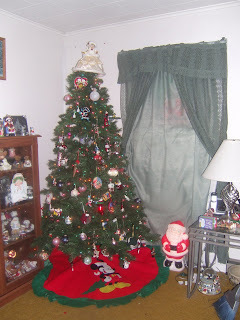 This is the first time in 3 years that we have decorated for christmas, since the passing of our 3 month old son on Dec. 6, 2004. 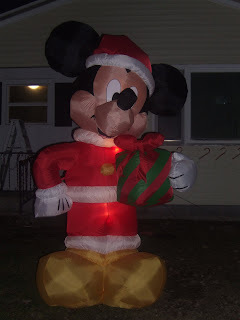 We have a blown up mickey that we got at Home Depot that is what got us into the holiday decorating mood. The box for the blow up said 1-2-3 assembly. It took it awhile to get him to be just right. I first set it up 2 different times and he was facing the wrong way. Then we had a problem with the tree, it had to have some branches cut off. Then we couldn't him to stand straight. I must say mickey is now standing tall! 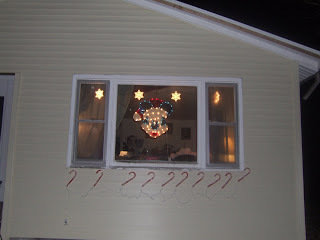 Tomorrow we have to run the rest of the cords for the other decorations but here is a start to our decorations. I will post the rest when they are all plugged in. Happy Holidays! Happy Thanksgiving to everyone! I had a nice quiet thanksgiving at home with my DH and dog Buddy then went to my parents for dessert. It was a very nice day. Buddy was excited to have his very own thanksgving fest. As you can see from the pictures below he was patiently waiting and watching daddy make dinner. Buddy is just like our child, thats why he is our furbaby. 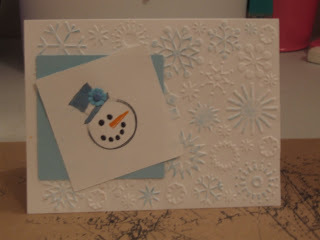 These a few of the christmas cards I am making this year for the holidays. 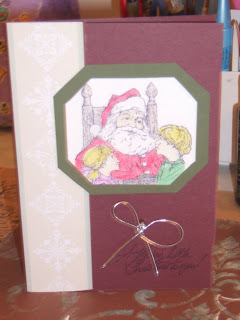 I am a little upset I was bragging to all my friends that my cards were done and yesterday I went to look again so I can start mailing them and I only have 5 done, They are not complete! I have to get busy!